Some voters in Prince George's County, Maryland, waited as long as six hours to vote because of ballot shortages at some polling sites. The county election board said they underestimated voter turnout. About 5 percent of the county's precincts were affected, officials said. 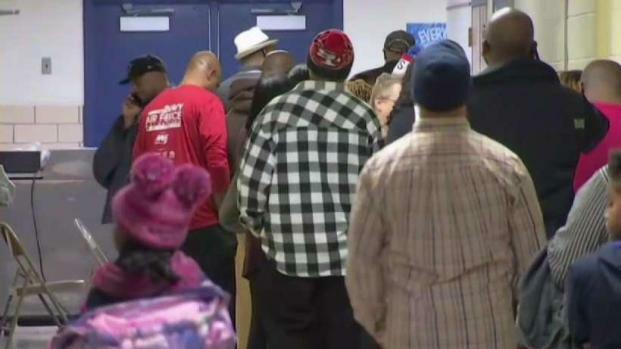 Several polling locations ran out of paper ballots before the polls closed in Prince George's County, Maryland, on Tuesday, leaving many people waiting in line for hours. 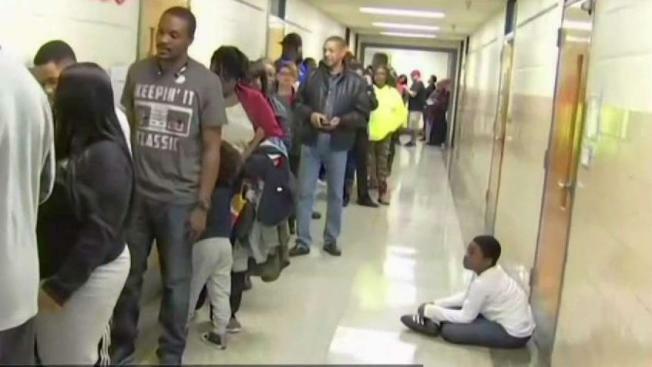 About 1,500 people were in line at Brandywine Elementary School after the location ran out of ballots at about 4 p.m., News4's Shomari Stone reported. Some people waited for six hours to cast their votes. "It's been, what, about three to four hours," voter Bobbi White said after she voted Tuesday evening. "But it felt good. We stuck in there and ate candy and survived. We made it." Someone donated pizza to help feed voters waiting in line. One woman took off her high heels as she waited. "Forget it. My feet hurt," she said. "Everyone's frustrated. ... It's been a long day. We've been waiting a long time," voter Steven Dew said. Prince George's County Board of Elections Administrator Alisha Alexander said officials underestimated voter turnout. The board based the ballot allocations on turnout for the 2016 presidential election, but for Tuesday's midterm election that number was just not enough. "We always use historical data at the various precincts to determine our ballot allocations, and that's what occurred. And unfortunately, there just weren't enough ballots," Alexander said. When elections officials were notified of the problem, they sent couriers to deliver more ballots, but they got stuck in traffic. It took about four hours for officials to get more ballots to Brandywine Elementary. The new ballots arrived just before 8 p.m., just before the polls were scheduled to close. Everyone in line voted, but not without a wait. News4's Shomari Stone explains a ballot shortage left voters waiting for as many as six hours. Election officials also delivered more ballots to Upper Marlboro Community Center after a Twitter user reported that voters had waited for more than two hours. Some people did decide to leave. About 5 percent of the county’s precincts were affected, the election board said. The Maryland Democratic Party said "unprecedented turnout" led to the shortage. On Tuesday, they reminded voters that anyone who was in line at 8 p.m. would be able to vote. The issue may have led to slow election results. On election night, the Maryland State Board of Elections said on its website that it would not post election results until all polls had closed. However, as of early Wednesday, the site was sharing results, with 1,983 of 1,991 precincts reported as of 5:25 a.m. That included 272 of 274 precincts in Prince George's County. The numbers did not yet include results for absentee or provisional ballots. The Prince George's election board was set to meet Thursday morning, with the problems Tuesday at the top of their agenda. Alexander said that in the future, officials would do their best to have more ballots on hand at polling sites.